I have been a long-time fan of the Nicci French collective, but I must confess that last year’s U.S. premiere of BLUE MONDAY, the inaugural volume in the Frieda Klein series, took my appreciation to an entirely new level. French, the collaborative moniker of husband and wife writing team Nicci Gerrard and Sean French, excelled in their stand-alone work. But the quirky, reclusive Klein, who is difficult to know though easy to appreciate, brings a welcome off-kilter viewpoint to her off-the-books investigations, one that is not always appreciated by the powers-that-be in her home base of London. TUESDAY’S GONE, the sophomore effort in the series, takes place about a year after BLUE MONDAY, and finds Klein somewhat pensive, continuing her practice as a clinical psychologist without any involvement in police matters. Until now, that is. "TUESDAY’S GONE is one of those great, great books in the mystery genre wherein the more you know the less you know --- peel back one stratum and you cannot shovel fast enough to get into the next, which reveals anything but what you expected." 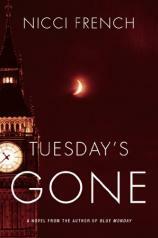 TUESDAY’S GONE opens with a chapter that you will not soon forget, no matter how jaded you are. I won’t give it all away, other than to say that a London social worker doing some home health visits makes an extremely grisly and bizarre discovery at the flat of Michelle Doyce. Doyce introduces the worker to a rapidly decomposing body and then proceeds to serve afternoon tea to the corpse. London Detective Chief Inspector Mal Karlsson is in charge of the investigation, which is brick wall material, given that the corpse is not only unidentified, but also unidentifiable. He brings in Frieda Klein to try to make some sense of Doyce’s muttered and generally incomprehensible rambling, but even Klein is unable to cobble together anything resembling a clue from her. At least, that is true at first. The higher-ups are ready to treat the deceased as the victim of a homicide, with Doyce as the doer; given her mental state, she will never be brought to trial, but will receive medical treatment probably for the rest of her life. Klein, though, is intrigued enough by the matter that she simply cannot let things go. She manages to obtain a very slender clue with some additional professional assistance, and from that learns the name of the deceased. The late Robert Poole was many things to many people, but to him, each and all of them were different breeds of sheep, ripe for the hunting. Someone obviously turned the tables on him. But who? There is no lack of suspects, though some fit the bill better than others. TUESDAY’S GONE is one of those great, great books in the mystery genre wherein the more you know, the less you know --- peel back one stratum and you cannot shovel fast enough to get into the next, which reveals anything but what you expected. French takes the novel on a number of unexpected twists and turns, not the least of which relates back to BLUE MONDAY, which, as it turns out, didn’t quite end on its last page. Or, for that matter, at the end of TUESDAY’S GONE, either. Or did it? We will have to wait for the third volume, WAITING FOR WEDNESDAY, to find out. Maybe. In the meantime, this latest effort will keep you reading and wondering.